The Burning Times, English Language, color, negative format 16 mm., written by Erna Buffie, produced by the National Film Board of Canada, released in 1990, 56:15 minutes long, directed by Donna Read, also released under the French title: Le temps des bûchers. This film The Burning Times purports to be a documentary in the form of a feminist account of early modern European witchcraft persecutions. It is part of a trilogy of films titled Women and Spirituality that attempts a feminist reinterpretation of history. It posits that women have been the traditional keepers of folk wisdom such as midwifery, healing, and agriculture, and that men and Christianity were threatened by their power and thus systematically persecuted them. The film provides narrative monologs from contemporary witches and experts and as all films do furnishes illustrations and moving images to enliven the film. While historical feminist revisionism has merit and women have authentic historic grievances with some church practices The Burning Times does not a help those causes. Critics have pointed out numerous faults, errors and exaggerations in the film that are presented as facts. For Mennonites one of the egregious faults of the film is the use of numerous engravings of Anabaptist female martyrs, passing them off as if they were martyred for witchcraft. Further The Burning Times leaves all these known martyrs anonymous. 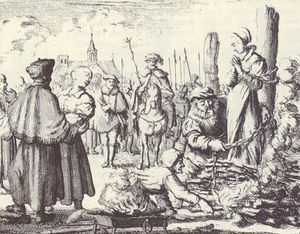 The Mennonite engravings used in the film are by the Mennonite Jan Luiken and originally published in the Martyrs Mirror. One engraving, that of Anneken Hendriks tied to a ladder and being cast into a fire, was also used by the National Film Board (NFB) in its promotional materials and another the burning of Maria and Ursula van Beckum is often used online to identify the film. The source of these engravings is not acknowledged in the film. It should be noted that this engraving of Anneken Hendriks and several others by Luiken have also frequently been used erroneously to illustrate the evil practice of burning witches in many English language books on the history of witchcraft. From the 15th to 17th centuries the persecution of witches was a horrific evil. However, this film because of its numerous errors does damage to a feminist interpretation of witchcraft and brings embarrassment to the National Film Board of Canada. Jan Luiken's images from Martyrs Mirror at the following minutes in The Burning Times film: 13(2 engravings), 14, 25, 42(4), 43(2), 44(2). Wiebe, Victor G. "Burning Times, The (Film)." Global Anabaptist Mennonite Encyclopedia Online. February 2019. Web. 26 Apr 2019. http://gameo.org/index.php?title=Burning_Times,_The_(Film)&oldid=163218. Wiebe, Victor G. (February 2019). Burning Times, The (Film). Global Anabaptist Mennonite Encyclopedia Online. Retrieved 26 April 2019, from http://gameo.org/index.php?title=Burning_Times,_The_(Film)&oldid=163218. This page was last modified on 13 February 2019, at 18:31.